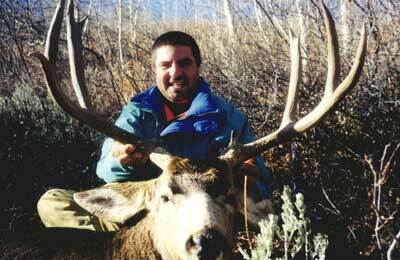 Clay Fragulia shot this nice mule deer buck while hunting with Western Wildlife Adventures during the 1998 season in Nevada. Fragulia's 4x4 measured 29 1/2 inches. If you want to hunt mule deer bucks in Nevada, you can't wait until this fall to get a tag. Nevada is a 100% draw state for deer tags. The deadline for applying for tags is in March. Applying with a guide application increases your chances of being drawn but you still have to hurry to get your application around as guides like Western Wildlife Adventures report having only a few openings left. If you are interested in booking a hunt with them, call Ron Lara at (408) 748-1277. 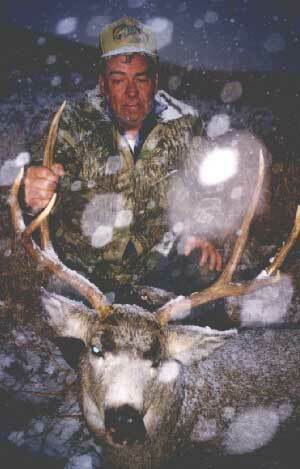 Don Stauffer shows off his 3x3 muley buck during a snowstorm in Nevada. Stauffer was also hunting with Western Wildlife Adventures.